Dinner is served at 6:30 PM. Reservations must be made before 5:00 PM the day of the show. Starting at Row 7. Dinner is served at 6:30 PM. Reservations must be made before 5:00 PM the day of the show. Rows 1-6. The Hughes Brothers Christmas Show! 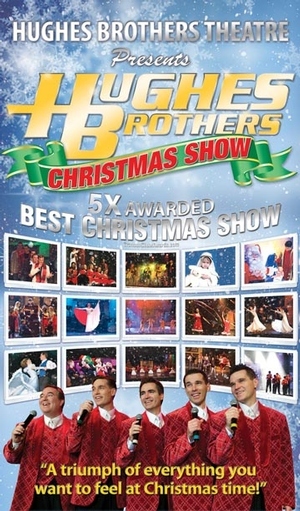 In November and December Te Hughes Brothers Show transforms to the Ultimate Christmas Experience in Branson Mo! The Hughes Brothers family transport you to a Christmas wonderland filled with the season's best vocal harmonies, exciting dances, inspiring instrumentals, and of course, the enchantment and light-hearted humor that everyone loves about the Hughes Brothers Show. Along with all the festive Christmas and treasured family holiday traditionsns, see Santa in a new light when he explains the symbols of Christmas in the most moving Christmas presentation you've ever witnessed. "It's a triumph of everything you want to feel at Christmas time. "Be sure and make plans now to bring your whole family to see our family as we celebrate the best time of the year, Christmas!